Perched on top of the skyline of the Siena hills, the tower of Galatrona is the only vestige left of a castle that once marked the boundary between the territory of Siena and that of Arezzo until it was captured by Florence in 1335. Used as a fortified outpost, by the 15th century the castle had been surrounded by a fortified village, incorporating some twenty humble dwellings of farmers. At this point in time its role was to protect local inhabitants from marauding bandits and the pitiless passage of mercenary armies, and to keep watch on Florence’s restless neighbour, Siena. In the first half of the 16th century, the castle and the whole of the Valdambra (the Valley of the Ambra river that leads down to Siena) saw battles between the Medici and Siena, ending in the defeat of the latter and Siena’s definitive subjugation to the Grand Duchy of Tuscany (1555). Today the tower has been restored and can be visited. 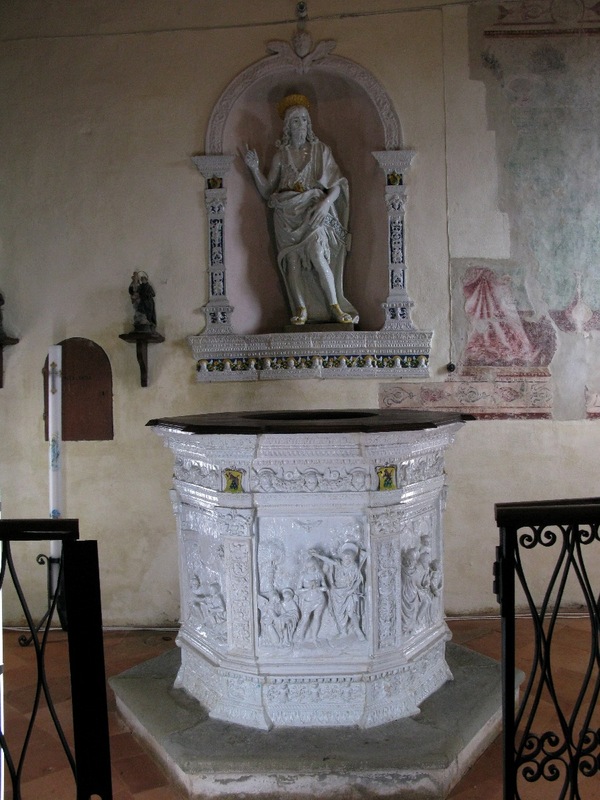 You can drive (in a jeep) up to tower itself, leave a normal car 500 meters downhill and walk up, or hike all the way, past the medieval church of Galatrona (do not miss the elaborate Della Robbia baptismal font, in white glazed terracotta) and up a narrow and scenic road. During visiting hours you can climb to the top for a view that stretches over the entire Valdarno, gaze down on the vineyards of the 17th-century villa of Petrolo (home of a prize-winning super Tuscan wine called Torrione, after the tower), and admire the wooded hills of the Chianti to the West. 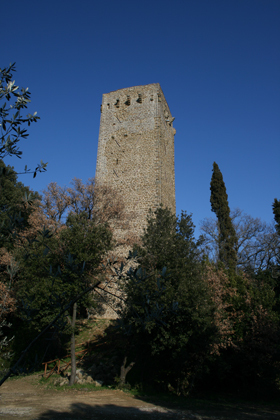 On YouTube look up “Torre di Galatrona” for two videos, one of which features bicycle enthusiasts and a dizzying 360° panorama from the top of the tower, and the other an historical re-enactment with participants dressed in medieval costume, interspersed with views of the tower, its surroundings and various access routes.